IBM® DB2® Tools for z/OS® support and take advantage of the latest versions of DB2 for z/OS. These tools are integral for the administration of the DB2 for z/OS environment and for optimization of data performance. In addition, the IBM portfolio addresses additional client requirements in the areas of data governance and version upgrade acceleration. Underlying the operation of any database management system are the utilities. With the number of database objects growing exponentially, managing utility jobs, meeting service level agreements (SLAs), and ensuring recoverability can be overwhelming. 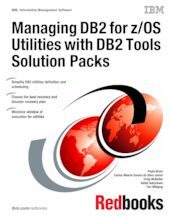 IBM offers DB2 Tools solution packs that assist in the DB2 utilities management process. Solution packs combine several products into a single consolidated solution providing everything necessary to ensure the execution of a set of database administration functions. The goals are to reduce the operational complexity and reduce cost. The objective of this IBM Redbooks® publication is to document the added value in terms of productivity and performance for database administrators when using the IBM DB2 Utilities Solution Pack and the IBM DB2 Fast Copy Solution Pack. We show the functions of the tools provided by the solution packs as used in real-life scenarios and adopting utilities best practices.